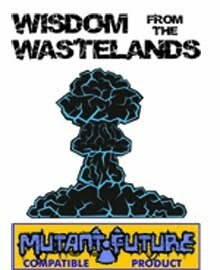 Skirmisher Publishing LLC is proud to announce the release of Wisdom from the Wastelands Issue #25: Metamorphosis I! This publication is authored by Derek Holland and Chris Van Deelen, authors of multiple Mutant Future supplements, and is available through online venues that include DriveThruRPG (5 pages; $0.99). We hope you will enjoy it and say positive things about it on the sites to which you contribute! In poetry, the transformation from caterpillar to butterfly describes how something ugly becomes uniquely beautiful. But in nature metamorphosis is common as living things change forms over their life cycles. And this change is not just traditional fairy tale beauty: maggots become flies, tadpoles become frogs, and chest bursters become alien warriors. The eight creature sets in this issue show how very dissimilar creatures can be the same species, just young or mature forms. Each entry uses either the animate seeds plant mutation; a new version for animals called larval form; or the idea of forced metamorphosis. The last is a version of the mutation modifier environmental dependence, one that permanently changes one creature into another when the original is exposed to certain stimuli. Some of the creature entries also use several new mutations, and these are included at the end of the issue. 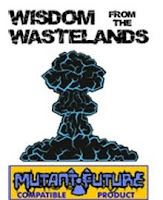 Wisdom from the Wastelands is dedicated to providing useful information, game content, and ideas to players of modern, science fiction, and post-apocalyptic table-top and role-playing games in general and to fans of Goblinoid Games’ Mutant Future RPG in particular. The material it contains are compatible with it and any others that use the "Basic" system introduced in the most popular role-playing games of the early 1970s and are easily adaptable to many other games (especially successor systems, to include those covered by the Open Game License). Our goal is for each thematic issue of this publication to contain a variety of useful and earnest content that will inspire Game Masters and players alike and provide them with things that they can immediately plug into their games.